Is the presence of a radiological finding of calcification on the medial side of the knee as a consequence of trauma, plus clinical symptomatology of pain and diminished range of motion. This calcium deposit develops between the attachment of the medial collateral ligament and medial condyle. The radiographic finding of the lesion is termed Pellegrini–Stieda phenomenon/lesion/sign, whereas the combination of the radiographic anomaly at the designated location with pain at that site is known as Pellegrini–Stieda syndrome. Although the MCL was most often coined as the origin of the lesion (54% overall, 25% on MRI, and 57% during surgery), many cases remained undecided (50% on MRI) or no specific structure was found to be the origin (29% during surgery). The medial/tibial collateral ligament (MCL) is a broad, flat band that extends from the medial femoral epicondyle to the medial meniscus, tibial plateau, and adjacent shaft. It consists of superficial and deep components. The superficial component attaches distally to the medial aspect of the tibia and proximally to the medial femoral epicondyle. The deeper component originates from the medial joint capsule and attaches to the medial meniscus. The superficial component is about 10 cm long and flat. The bursae separate the capsule and the medial meniscus of the superficial component. It may be one or more bursae. The superficial component of the medial collateral ligament crosses, in his way down to the medial site and posterior medial surface of the tibial, the tendons of the sartorius, gracilis and, semitendinosus, also separated by a bursa. Below the ligament runs the medial inferior geniculi vessels and nerve and the anterior section of the semimembranosus tendon. The deeper component is shorter than the superficial and descends posteriorly to the medial tibial plateau, proximal to the groove for the semimembranosus. The medial collateral ligament is an important ligament, it has an important role in stabilizing the knee joint. The long fibers of the MCL primarily stabilize the medial side of the knee against valgus and external rotatory stress. The deeper part of this ligament also helps the anterior cruciate ligament in avoiding an anterior translation of the tibia on the femur. The Pellegrini-Stieda syndrome is a relatively infrequent phenomenon and is commonly associated with sporting injuries. [5, 6] PSS Is more frequently in the male gender between 25 and 40 years of age. Ossification could happen within 11 days to 6 weeks after post trauma. A network of the new bone formation around the periphery of the mass of the medial condyle is formed in 6 to 8 weeks. Duration of the condition is usually about 5 to 6 months. Pain and local swelling in the medial aspect of the knee are the two first symptoms following an injury like traumatic synovitis. The pain and disability will increase after a few weeks or months. The knee will be stiff with the limitation of flexion–extension movements of the joint. The stiffness in the knee will mainly hamper the stretching of the knee but also twisting of the knee will be rather difficult. In addition to the limitation of motion, it is possible that a tender lump can be seen on the inside of the knee. The majority of patients are asymptomatic. When a full range of motion in the knee is attained, and the athlete does not feel any form of pain, he can resume his activities. It is also important that the range of motion is symmetric on both sides. Also, the muscles, Quadriceps, and Hamstrings, have fully recovered. This means full power recovery. The combination of Pellegrini–Stieda phenomenon/lesion/sign, plus localized pain on medial side of the knee and diminished range of motion is enough to diagnose this Syndrome. II: drop-shaped with inferior orientation and parallel to the femur: located in the TCL, without attachment to the femur. 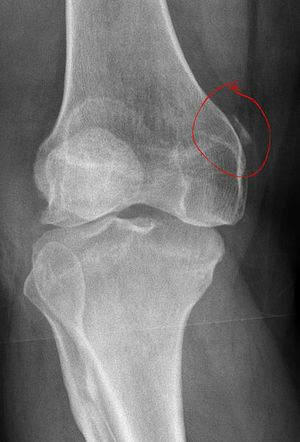 The patient complains about a severe, recurrent pain in the inner aspect of the knee. 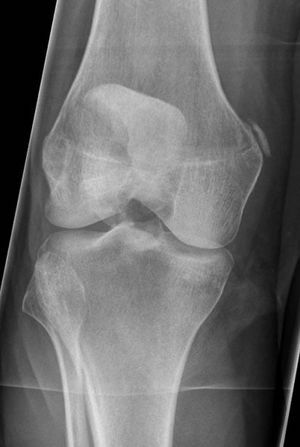 Most of the patients sustained an injury years, months or weeks earlier.The gait of the patient is normal with mild tenderness over the medial border of the knee.In most of the cases, on examination, no swelling can be observed.The patient has some difficulty with full passive extension or twisting of the knee. There is no ligamentous laxity. The treatment of the PSS is usually conservative. If severe movement restriction because of damage of the medial collateral ligament, surgical excision of the calcification and ligament repair have been performed with good outcomes. The pain is gone and the knee again has his full range of motion. Their removal in the early stages of the disease is not recommended because of the high risk of relapse. Measures such as rest, physical therapy, steroids, and lidocaine injections have been successfully used. First conservative work, with emphasis on avoiding overload and microtrauma, therefore forced rehabilitation or early sports resumption is to be avoided. Ice therapy is useful, as well as local and general antiinflammatory. (level of evidence 5) Even conservative rehabilitation and mobilization of the knee joint are necessary. The different steps of the functional rehabilitation can be completed, only in a more controlled and slow manner. knee bending on the stomach. ↑ 1.00 1.01 1.02 1.03 1.04 1.05 1.06 1.07 1.08 1.09 1.10 Restrepo, J. P., & del Pilar Molina, M. Pellegrini–Stieda syndrome: More than a radiological sign.Revista Colombiana de Reumatología (English Edition).2016; 23(3): 210-212. ↑ 6.0 6.1 6.2 Somford, M. P., Lorusso, L., Porro, A., Van Loon, C., & Eygendaal, D. The Pellegrini–Stieda Lesion Dissected Historically. The journal of knee surgery.2018; 31(06): 562-567. ↑ Ridley, L. J., Han, J., Ridley, W. E., & Xiang, H. Beak‐type Pellegrini Stieda lesion. Journal of medical imaging and radiation oncology.2018; 62: 120-120. ↑ 16.0 16.1 16.2 Prof. Dr. R. Meeusen , Vrije universiteit brussel, cursus 488, (2011). ↑ Lephart, S. M., & Henry, T. J. Functional rehabilitation for the upper and lower extremity. The Orthopedic Clinics of North America.1995; 26(3): 579-592.